I just got home from a cultural/historical solo trip at Real Fuersa de Santiago aka Fort Santiago. I entered the fort without the usual fee of P50 for students/children and P75 for adults. I told the guard that I would be attending the lecture of Professor Roberto Paulino of UP. The lecture started at 4 pm, just the same time when I arrived. It was some 40 minute lecture, all about Rizal and his legacy. Among the guests are consuls from different countries, professors from renowned universities and even a descendant of Rizal. 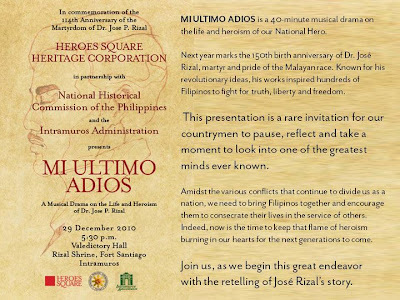 I felt the start of Rizal @ 150 commemoration. When it ended, I was surprised when the emcee invited us all who attended the lecture to have a merienda. There were spaghetti, squid rings, a bread of unknown name, siopao, and some tarts. After the delightful meal, the musical drama entitled "Mi Ultimo Adios" began. I like the flow of the story, and the lines as well. The one who portrayed Josephine Bracken performed perfectly with an exceptional fluency. The ones who played the role of Donya Teodora and Padre Sanchez sang greatly. And of course the actor who played Rizal is performed flawlessly. "Adios patria adorada, region del sol querida..." I can still hear those precious lines from the poem "Mi Ultimo Adios" as the actors sang it. It was a great play after all. The event lasted until 7 in the evening. Already dark outside. From then until 8 PM, I strolled at Intramuros and Luneta Park. I just want to see the new dancing fountain at the park. It was a tiring walk though. Thank you for writing about the event. 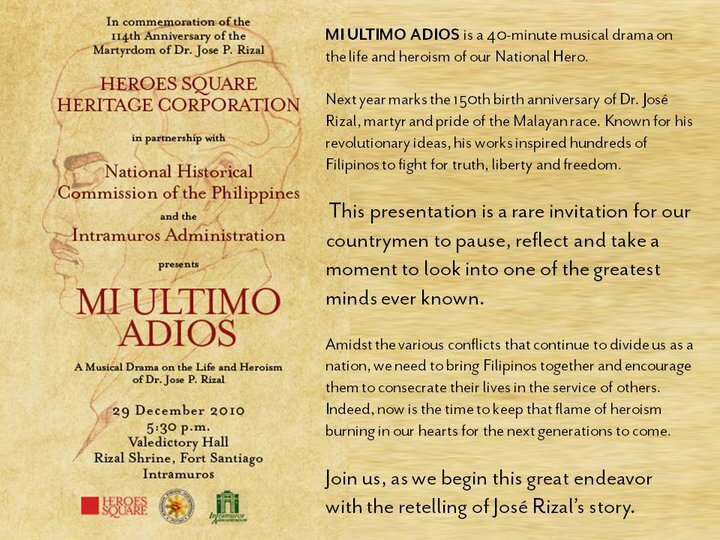 The musical presentation on Rizal's life was sponsored by the Heroes Square Heritage Corporation. I hope you can help us spread the "good news" that we aim to share: that we can be Heroes of our generation! Again, thank you for coming. Thanks to you too. It's just that I have a great interest in history. and I idolized Rizal. I'll spread the good news as much as I can.